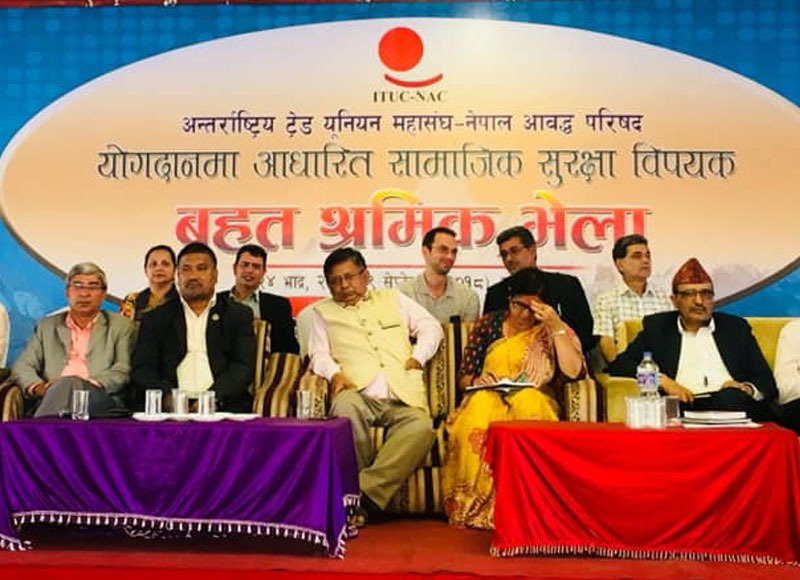 Aiming to create common consensus on social security International Trade Union Confederation Nepal Affiliates Committee has organized mass gathering in Kathmandu. Addressing the gathering Director of Social Security fund Mr. Shyam Raja Adhikari briefed that for the registration purpose new software has been launched and testing in some of the industries of Balaju Industrial Area. Till the date very few technical problems has been seen in the software & our resource has been already involved to fix it. The social security fund is ready to register employee and employers. Once government will start registration we are ready to implement it. The schemes will implement by consulting with government, employer and Employee. On the occasion, GEFONT Vice President and Advocate Cde. Ramesh Badal Highlighted that without registration Social Security schemes will not implement. To implement the schemes Employees & employers have to register themselves. He has further added, as a part of awareness campaign Trade Unions has been raising the registration issue. Employers and Employees will get registration numbers once they registrar themselves in Fund. He also informed that, Social Security number will remain same even if the Workers change their job. During the program GEFONT Secretary General Cde. Janak Chaudhary said” Social Security System will help to regulate labour reform system & it will help to systemize the industries. In the program, member of ANTUF secretariat & Advocate Cde. Yubraj Luitel highlighted, workers have to aware on their contribution. Likewise, Mr. Yogendra Kunwar Secretary General of NTUC briefed about Five schemes which will launch in the initial phase.